Free broadband videophone service for the deaf and hard-of-hearing at the Redding Library. We are furnished with a Sorenson VP-200, and serviced with Sorenson Video Relay Service (VRS). The library's videophone can dial out to the Sorenson Video Relay Services or any person with a compatible broadband videophone. The library does not accept incoming calls. For more information regarding the use of the broadband videophone service, please ask any of the staff in the Redding branch and they will be glad to help you. Sorenson Video Relay Service (VRS) is a free service for the deaf and hard-of-hearing community that enables anyone to conduct video relay calls with family, friends, or business associates through a certified ASL interpreter via a high-speed Internet connection and a video relay solution (or VRS call option). Providing free Braille and audio books, magazines and playback equipment to all eligible Californians unable to read standard print. 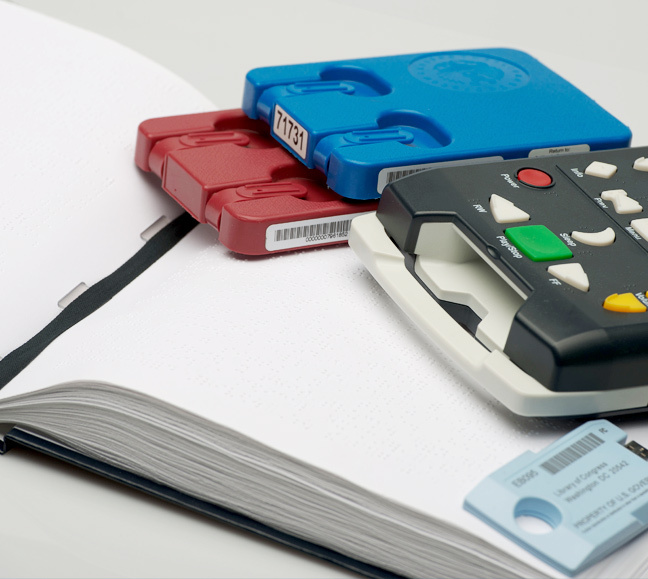 Find your local Braille and Talking Book Library and sign up for free library service. Provided by California's Library Services for People with Print Disabilities, in association with the Library of Congress. The Redding branch has 2 document enlargers which can be used to view documents, books, etc, at a larger size, located on the 2nd floor. The Redding branch offers a computer furnished with ADA accessible hardware and loaded with ADA accessible software for patrons with upper extremity and visual disabilities. This computer is offered free of charge, however, each patron must be familiar with the particular software and hardware they wish to use prior to using the equipment. Shasta Public Libraries does not provide instructional use for applications. Good for: low-vision users and users who have difficulty with contrasts. Good for: users who are blind.